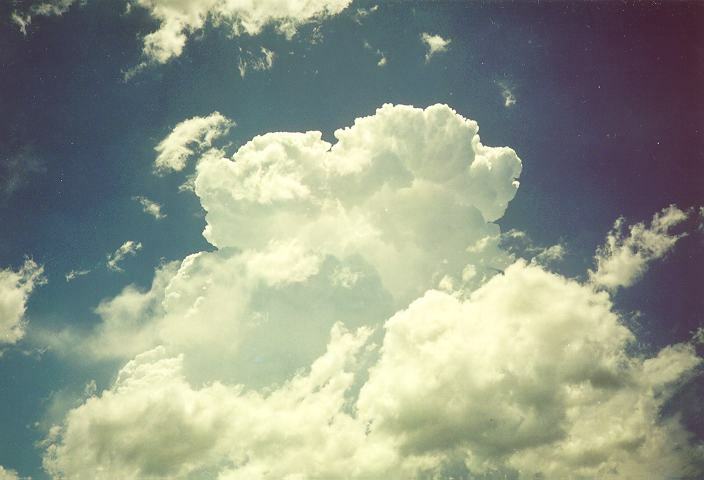 The appearance of cumulus like other clouds can be illusive. 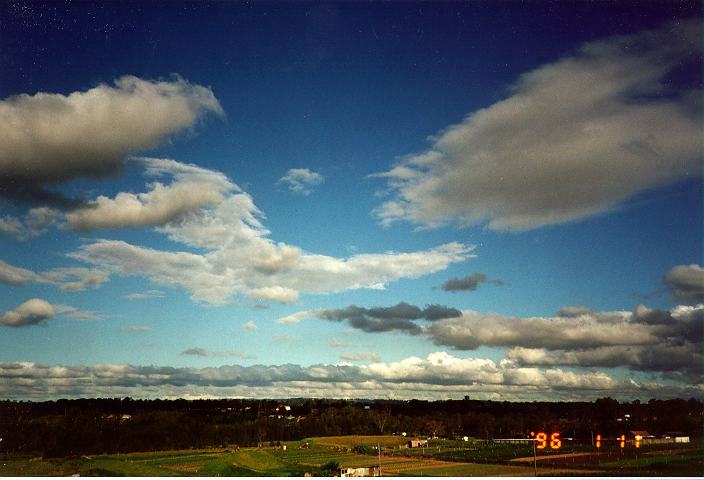 If stratus formed at the same level as cumulus, the cumulus will appear different observed from different perspectives with respect to the sun's position. (If light from the sun must reflect to get to the observer, then the cloud will tend to appear brighter and display more contrast than cloud reflecting very little direct sunlight. In fact, the latter case indicates that the shadow area of the cloud is facing the observer). 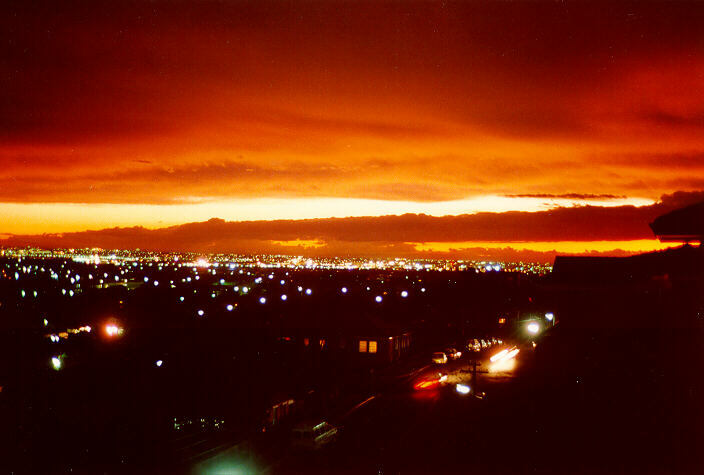 A similar situation may occur when observing cumulus below a much darker background such as a thunderstorm. 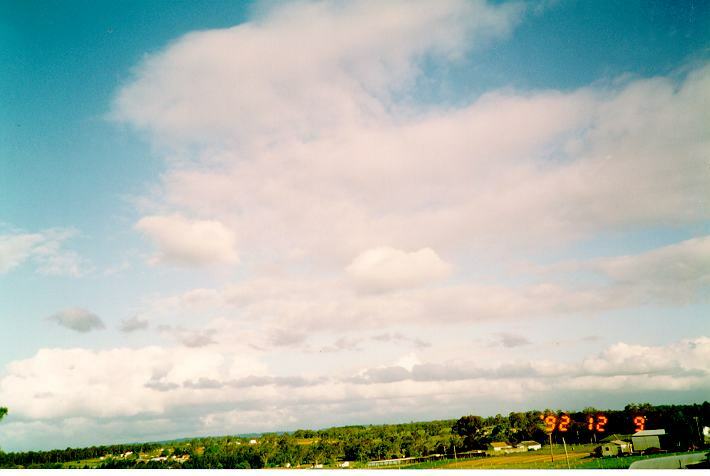 The cumulus clouds appear as a uniform white or at least much lighter with little or no contrast. The same cumulus clouds observed away from this cloud band will appear darker, with more contrast. 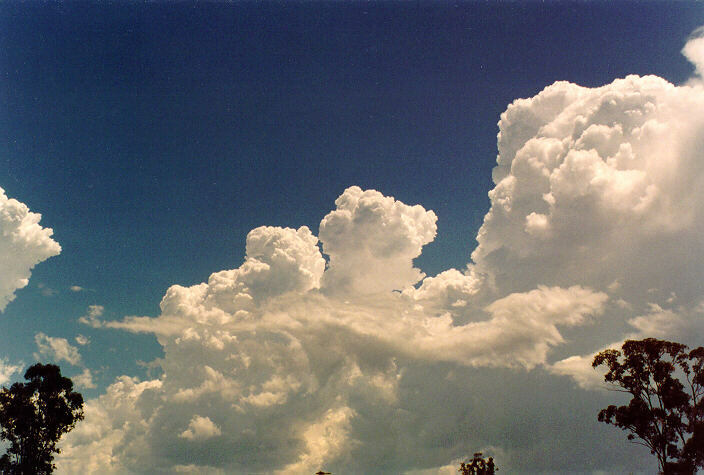 Cumulus can vary in size. 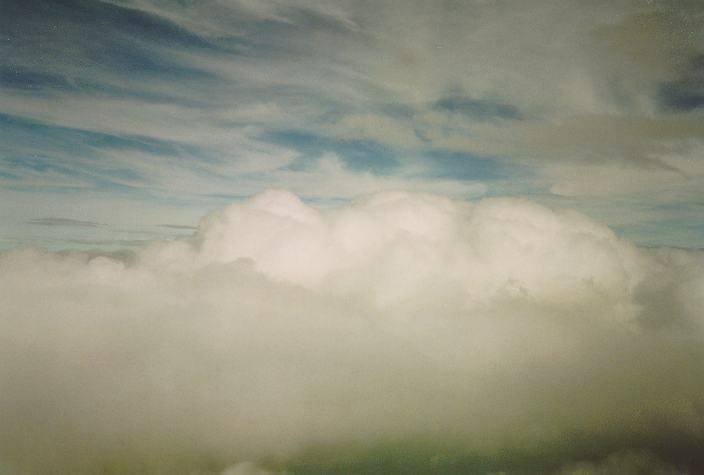 I normally categorises cumulus in three main groups: small, medium or large. 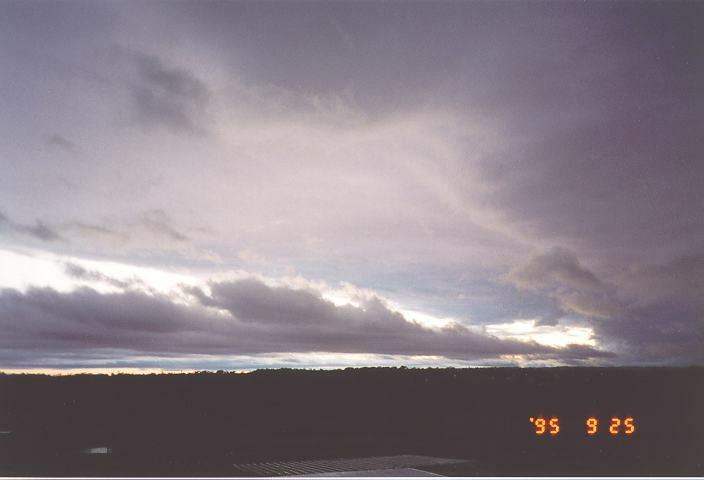 Stratus, like stratocumulus, can develop in weather conditions associated with thunderstorms and thunderstorm development. 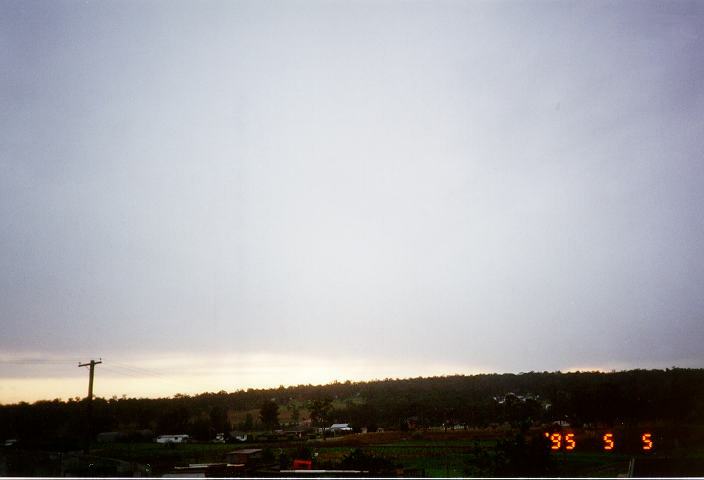 In this case, stratus is observed moving rapidly towards the storms and thickening in the region of the updraughts, especially those of severe thunderstorms. 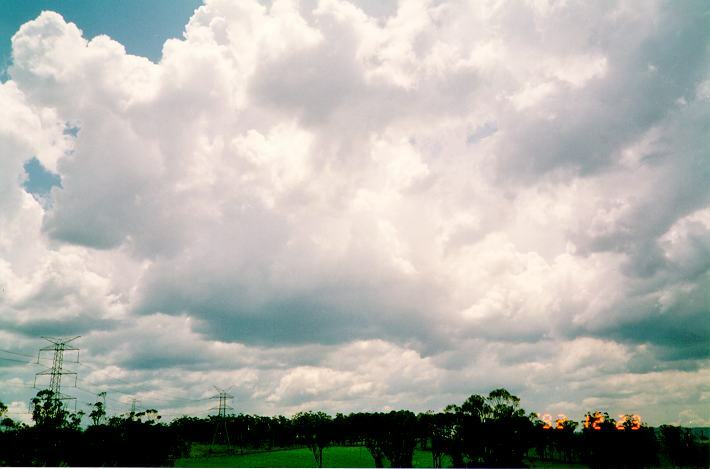 The stratus is only the visible condensed water vapour feeding into the thunderstorm. 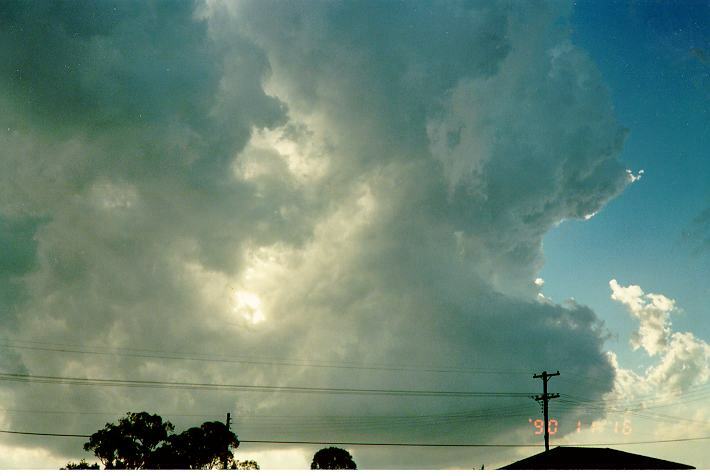 One good example of a thunderstorm illustrating this behaviour is the violent hailstorm that occurred on the 18th of March, 1990 in Sydney (This storm is not illustrated here). Earlier in the day, stratus had developed with a south to south-easterly change and was moving rapidly with the air stream. 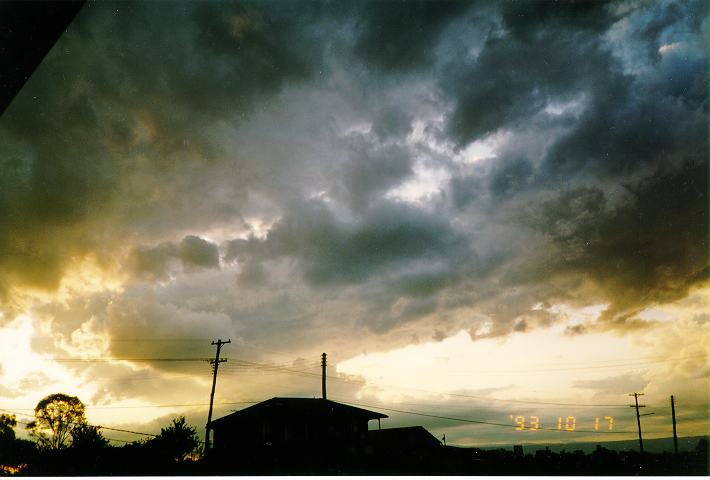 As the thunderstorms developed and approached, the stratus thickened to form stratocumulus. 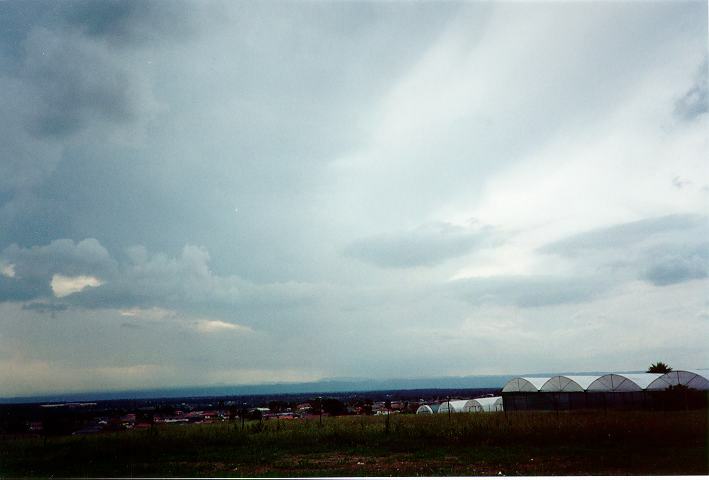 As the storm (which was a supercell) with the updraught region moved almost overhead, the stratocumulus cleared rapidly. The major rain band then moved through with strong winds, heavy rain and medium to large hail in some areas. 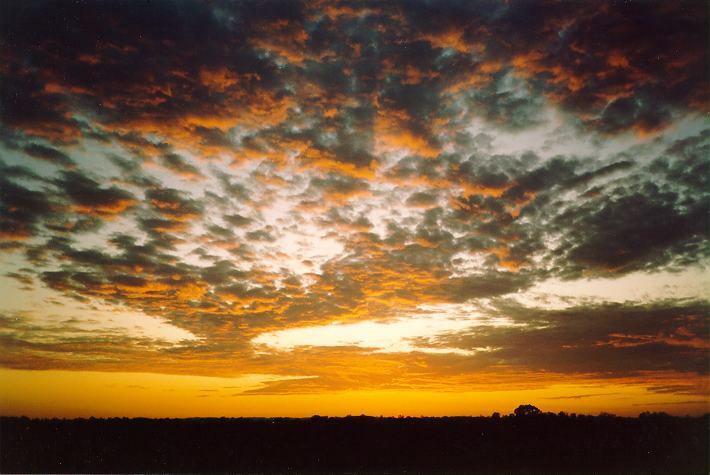 In its broken form, altocumulus can be confused with stratocumulus. 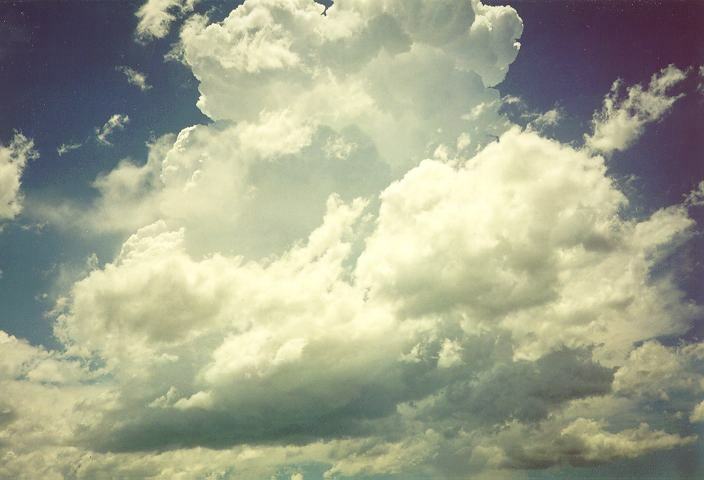 To distinguish between them requires examining how defined the cloud appears, whether there other forms of middle level or upper level clouds present above the layer and the difference in brightness. 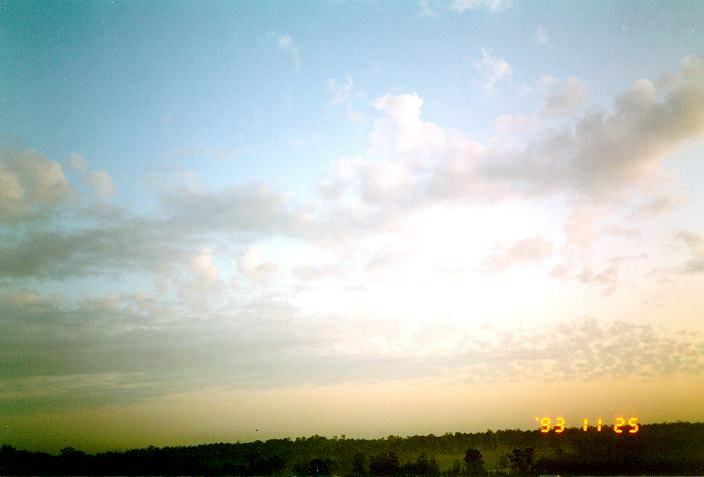 Like stratocumulus, the breaks become more visible at a steeper angle of elevation. 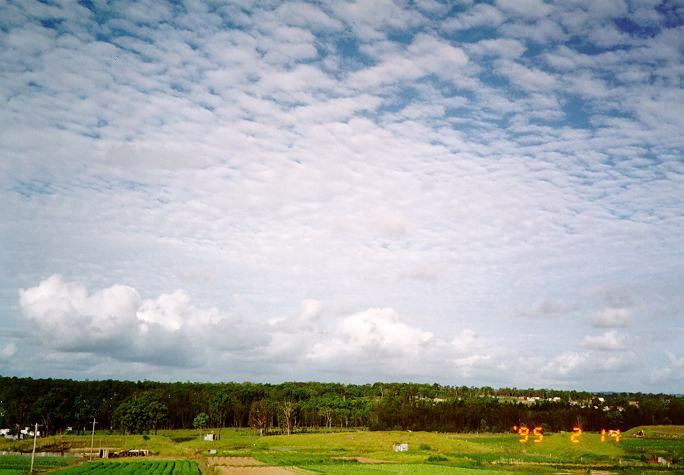 Altocumulus can vary in its apparent movement (speed) depending on the wind and direction at that level. 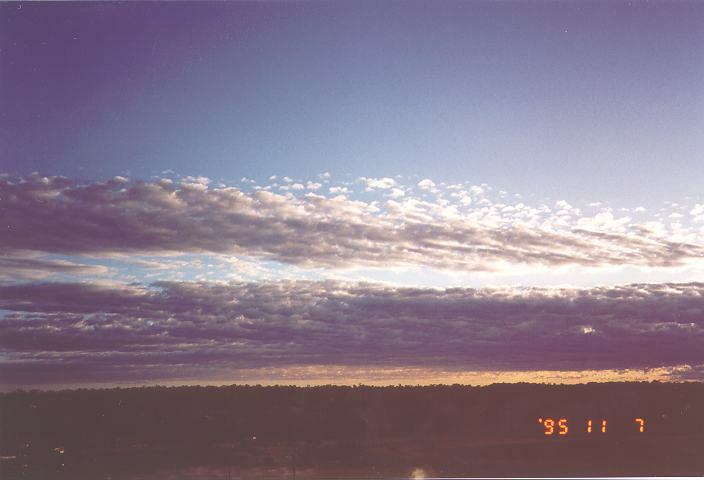 However, since altocumulus (like most other cloud types) represents an ever changing system, an observer must be careful in determining cloud motion. On some days, altocumulus continuously develop as it moves in the direction of the wind. Upstream, more altocumulus may develop giving the impression that the cloud is progressing slower than its actual speed. This process can occasionally create an illusion in terms of direction. Considering an example of altocumulus observed moving to the south east, because of development on the north and north-eastern side of the cloud band, the apparent direction may be more to the east. 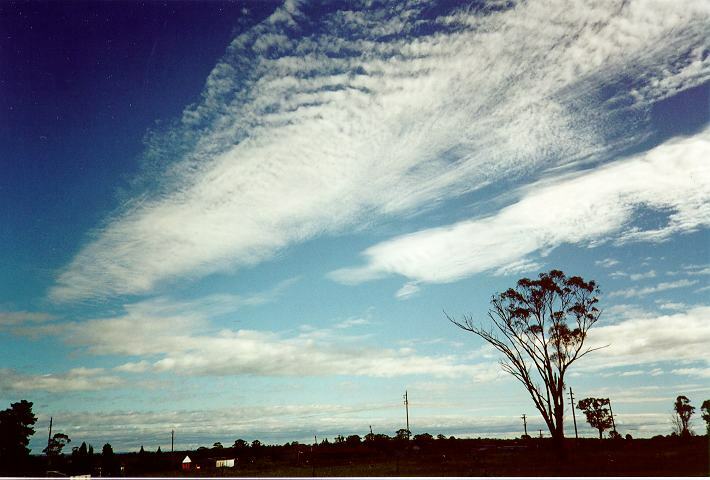 Altocumulus can develop in more than one layer and also in conjunction with other cloud types. 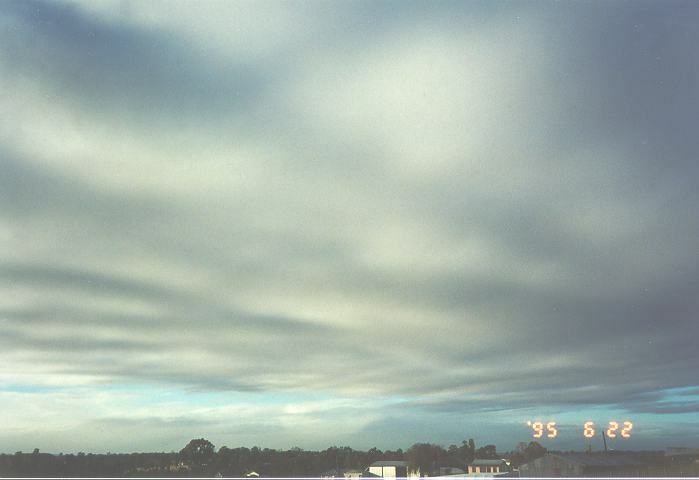 The lower layer will obscure part or all of the higher altocumulus cloud layer. This situation also applies to higher level clouds. Higher level clouds will be obscured by the altocumulus. Lower level clouds, however, will obscure part or all of the altocumulus cloud layer. In fact, it may be impossible to observe altocumulus above a full stratocumulus, stratus or lower level nimbostratus cover. 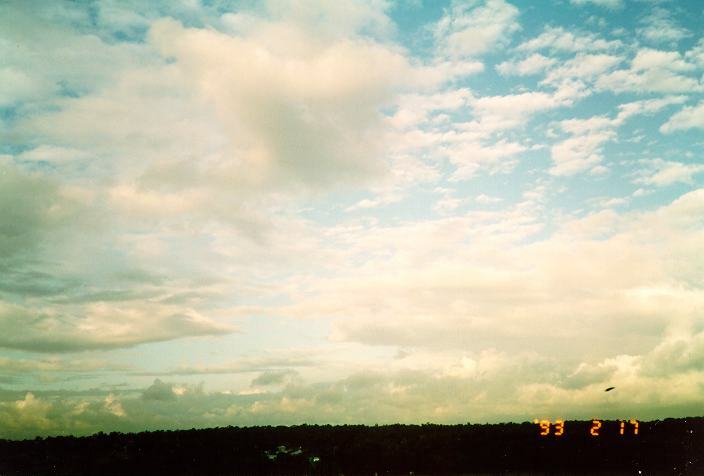 If a break occurs, altocumulus can only be distinguished by its different (slower) speed and direction of movement. 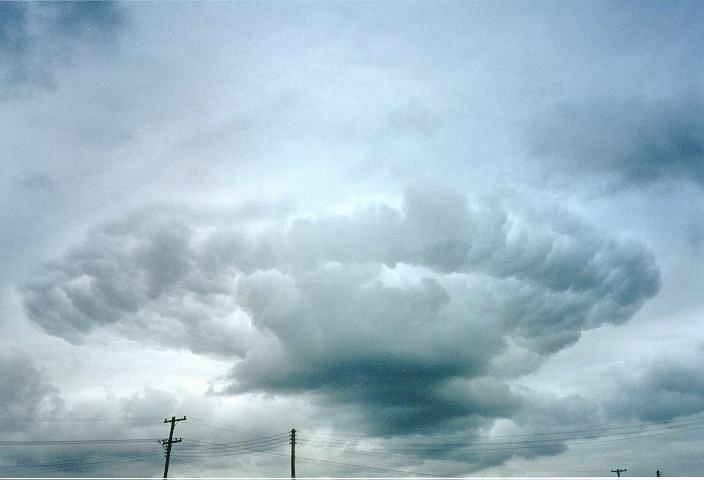 Altocumulus also develop within the structure of cumulonimbus (thunderstorm producing) clouds. 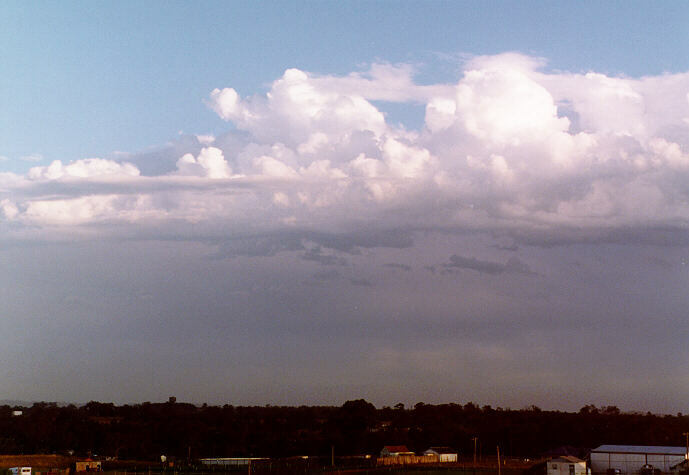 The appearance of altocumulus within thunderstorms vary depending on the structure, severity and the amount of moisture drawn into the thunderstorm. 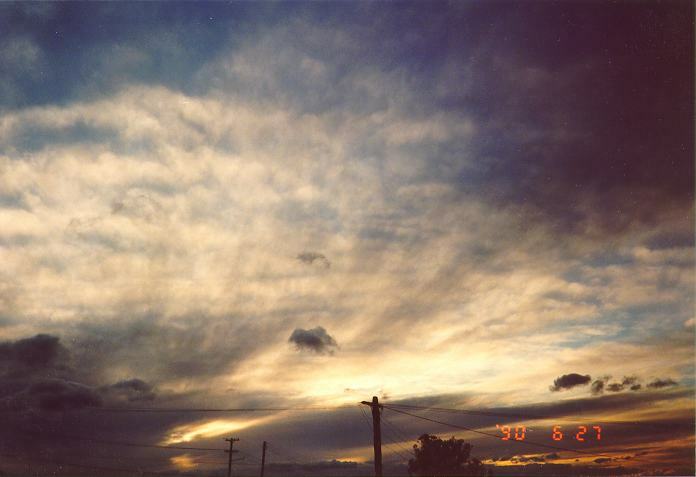 The altocumulus usually develops after the anvil (consisting of cirrostratus and altostratus) develops and becomes darker as the precipitation cascade approaches. 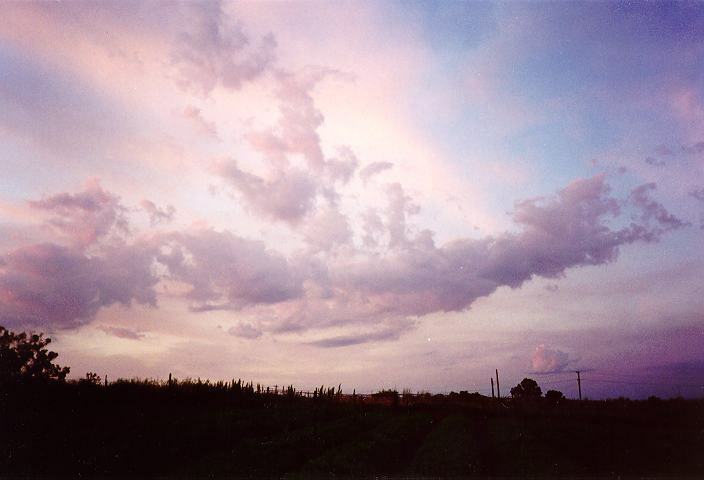 However, on days where thunderstorms develop with widespread altocumulus conditions, the altocumulus obscures the thunderstorms and its development observed only through breaks in the cloud. Precipitation within altocumulus can develop rapidly at the rear even though the cloud may be moving fairly rapidly. This will obviously influence the duration of rainfall as well as the normally large cloud base. This situation often occurs before a cold front with unstable conditions. Thunderstorms can develop amongst the altocumulus band or they may develop after the cloud band clears well ahead of the actual change. Another form of altocumulus is the lenticular type where the altocumulus appears in the form of a lens. They appear very smooth and flat, often displaying two or more layers. This occurs due to a wave effect in the air flow. This wave effect normally develops as a result of a mountain range on windy days. 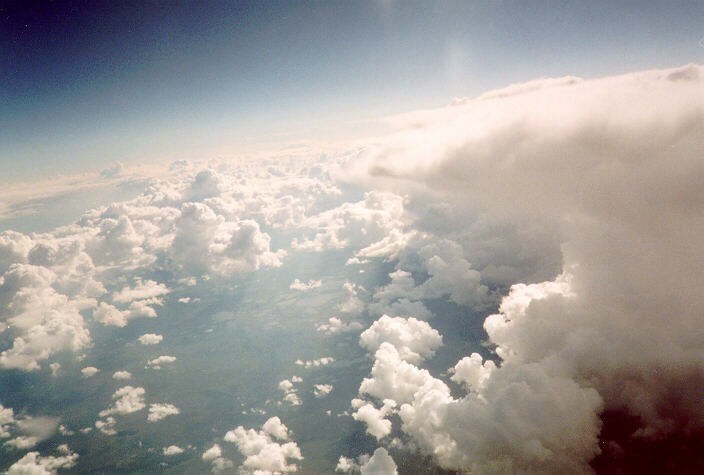 The wave effect forces air to rise above the condensation level and hence allows cloud to form. Due to the rise and fall effect (peaks and troughs), the cloud may only exist in areas of peaks and therefore appear patchy. The most striking feature of this cloud is that it tends to remain relatively stationary compared with the associated wind at that level. What is actually happening is that as the air begins to rise above the level of condensation, cloud forms. When the air falls below this level, dissipation occurs and the cloud disintegrates back to clear air. So long as the peak of the air wave remains stationary as compared to the ground, the cloud will develop and dissipate almost in the same position whilst the wind conditions persist. 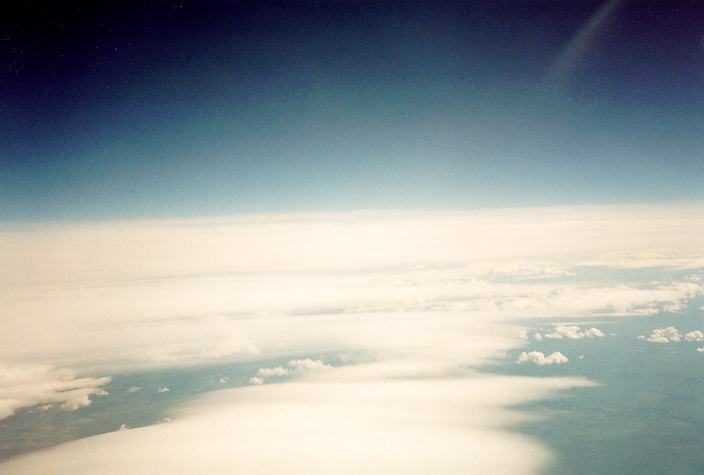 Lenticular altocumulus as viewed from above. 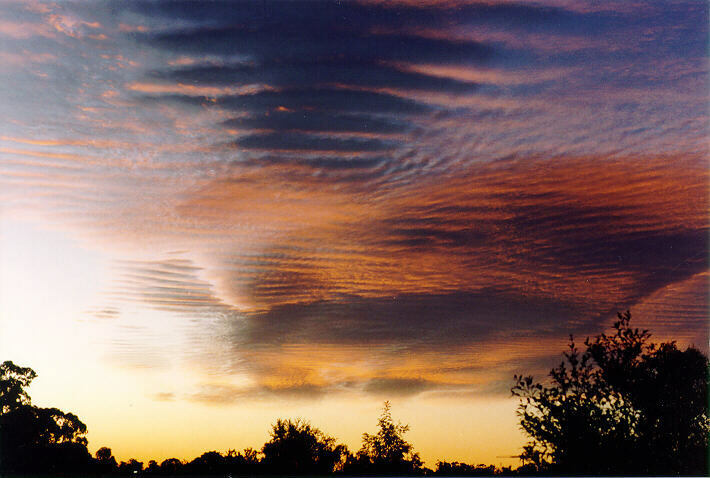 Altocumulus can also develop in the form of ripples. 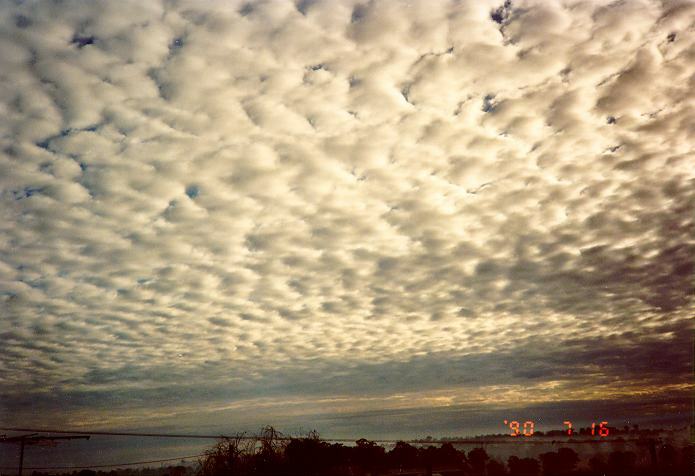 In this case, the altocumulus cloud appears broken but lined as a result of minor wind wave ripples. 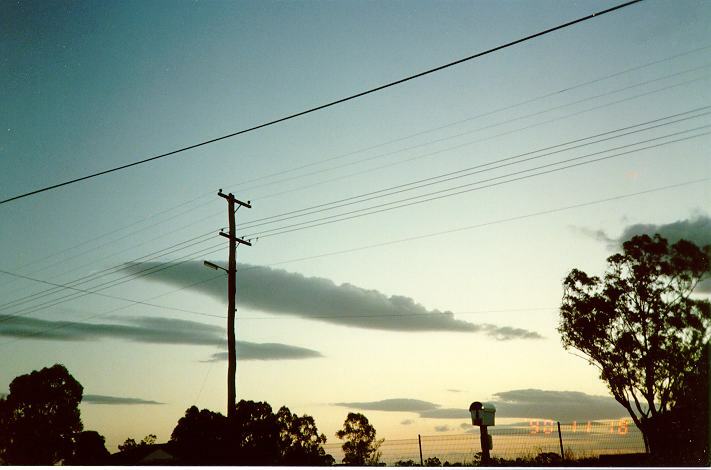 In fact it develops in conditions associated with the development of lenticular altocumulus. This type of cloud obviously does not produce precipitation. 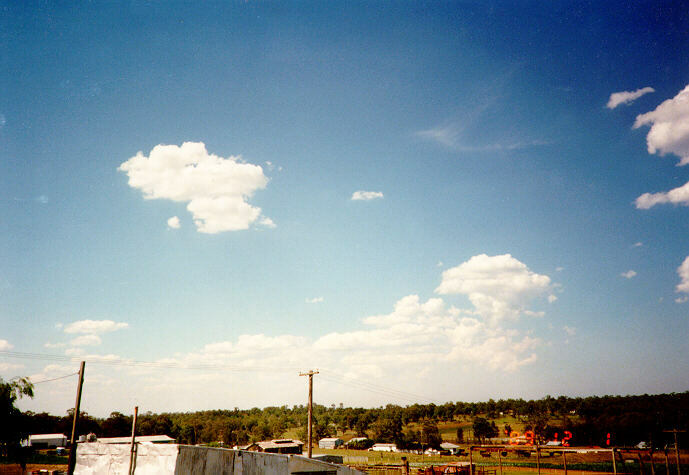 Altocumulus can develop from the spreading out of the tops of cumulus. 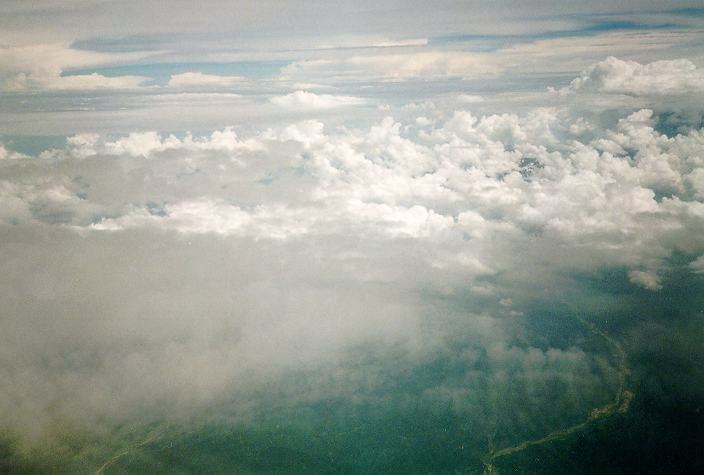 The spreading out occurs as the tops of the cumulus grows until it reaches an inversion layer (or stronger winds that cause divergence) situated in the middle levels of the atmosphere. 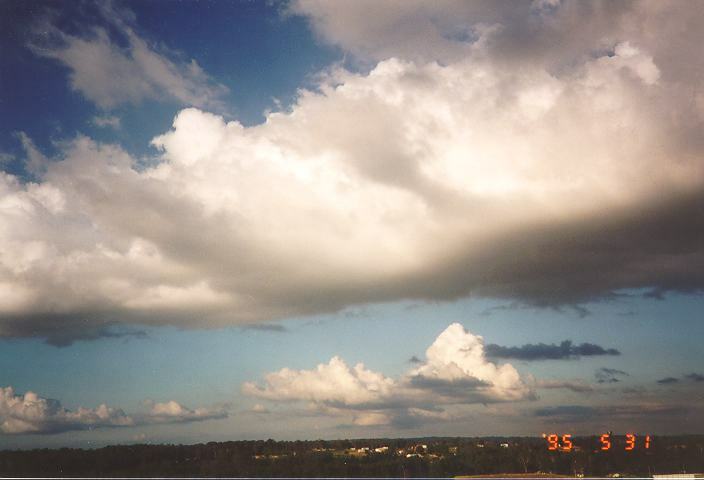 Because the cumulus updraughts are not strong enough to pierce this layer, the tops begin to spread in the form similar to that of an anvil facing in the direction of the wind at that level. Occasionally, this situation may further develop into thunderstorm or thundery shower conditions. 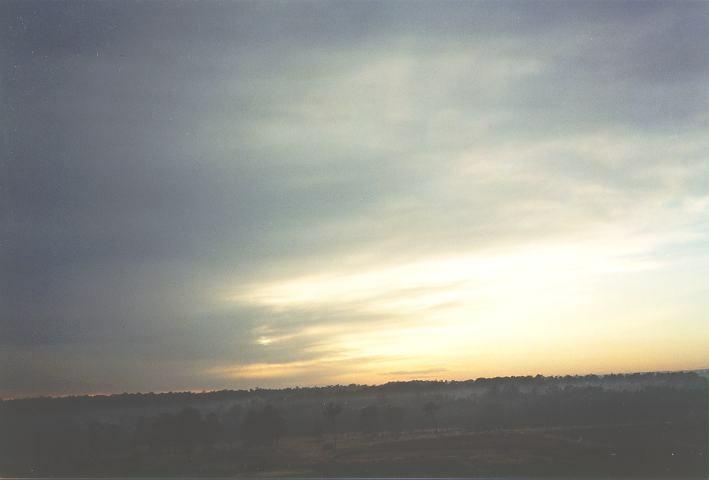 Altostratus refers to middle level cloud that appears as a flat, smooth dark grey sheet. 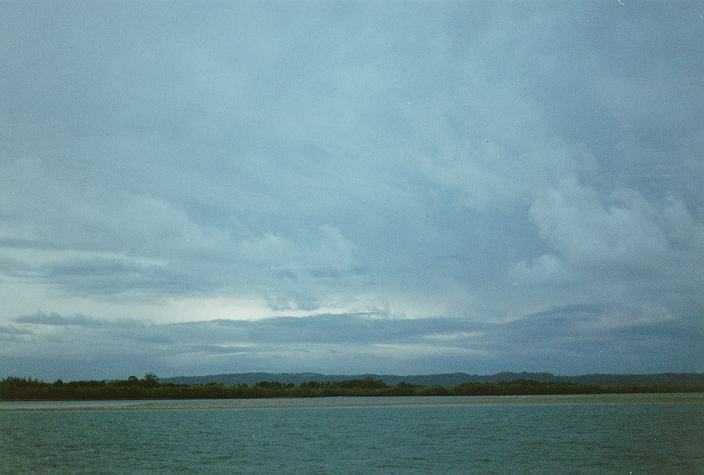 These clouds are most often observed as large sheets rather than isolated areas. 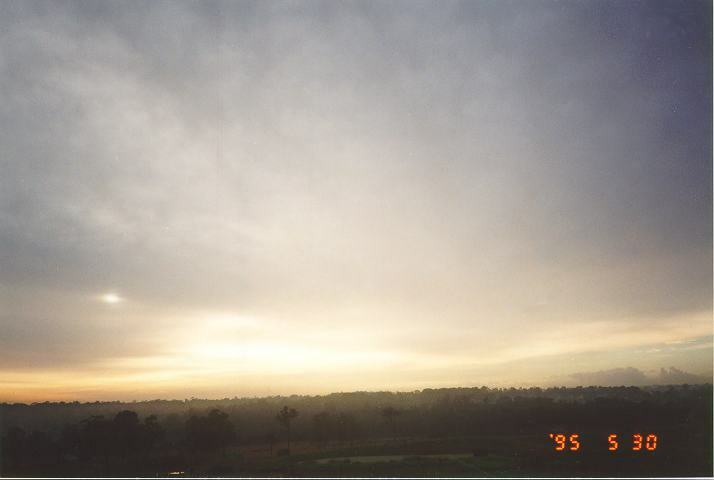 However, in the process of development, altostratus may develop in smaller filaments and rapidly develop to larger sheets. 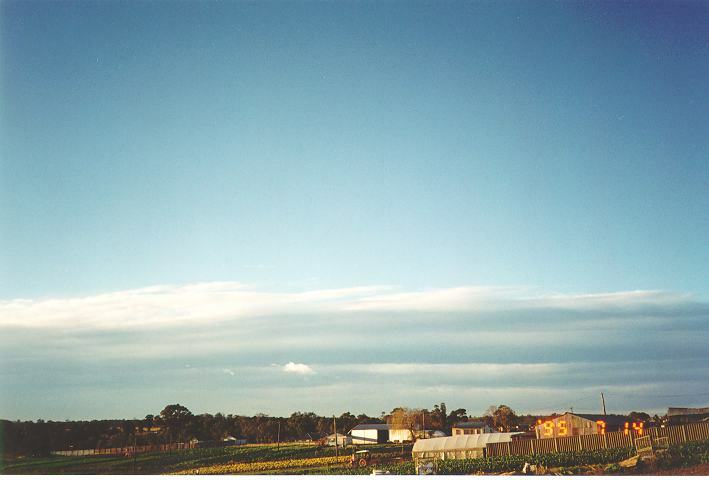 These types of clouds in certain conditions normally indicate an approaching cloud mass associated with a cold front, a trough system or a jet stream. 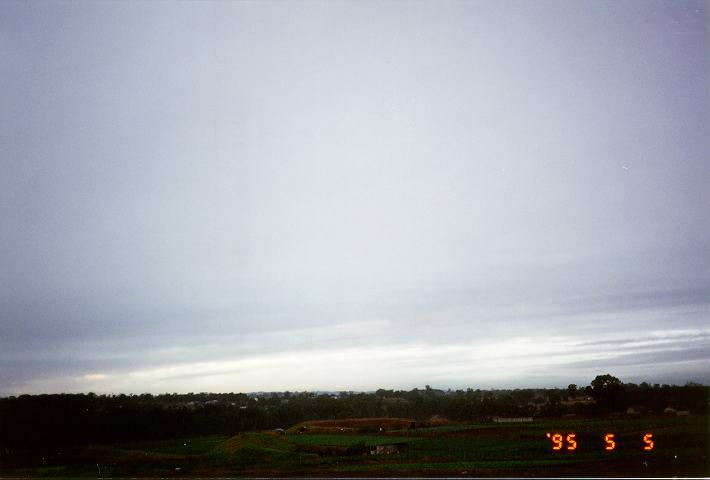 Altostratus can develop into a thick or thin layer. 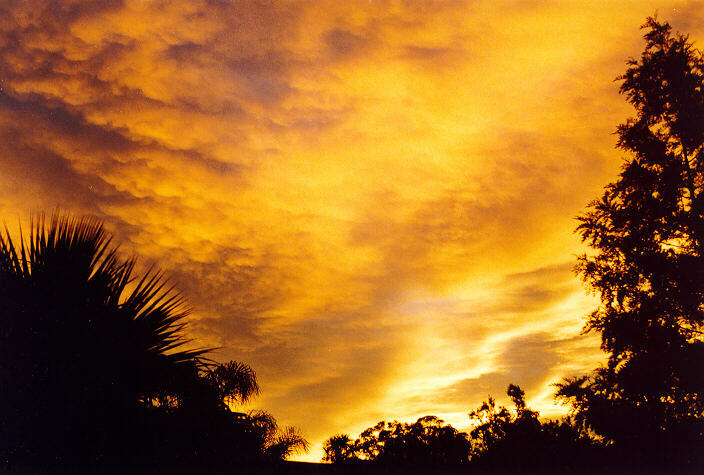 As a thin layer, the sun can be observed through the cloud. 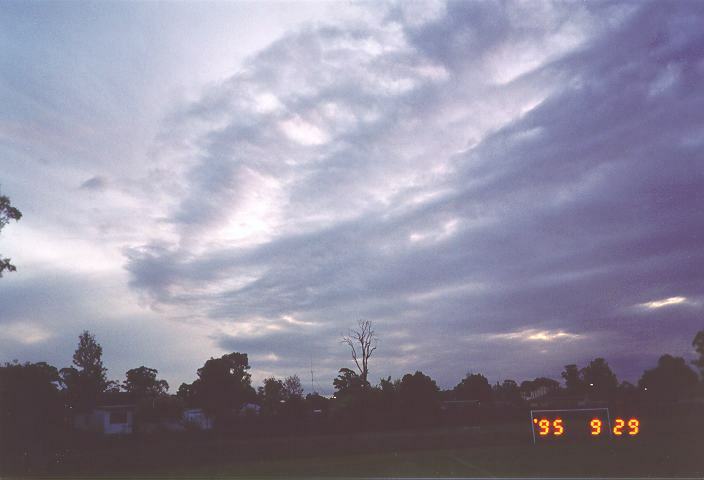 In its thinner form, the developing altostratus can sometimes be confused with approaching cirrostratus. In its thicker form, the sun can only occasionally be observed through the thinner sections if not at all. Obviously, the thicker the altostratus, the darker it becomes. 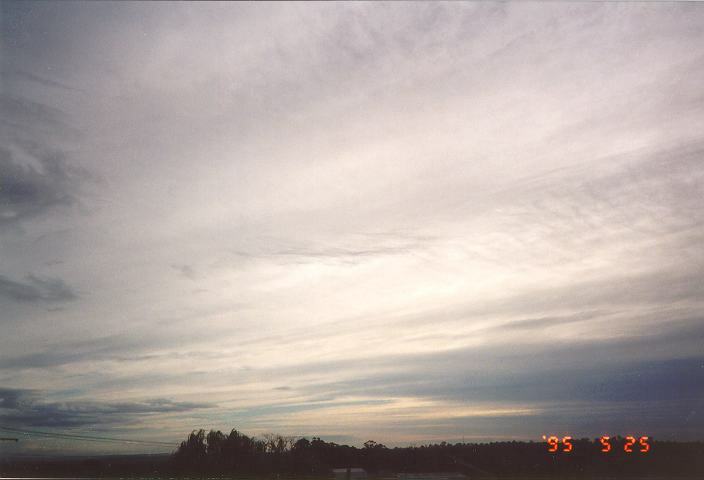 When observed closely, it becomes apparent that altostratus is not just one complete layer but a composition of several thin layers. 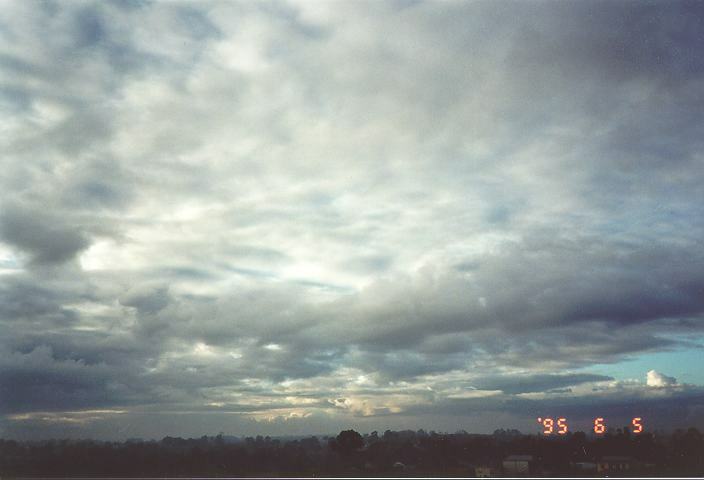 > In certain conditions, altostratus will develop during the afternoon period and increase to cover most or all of the sky. By late afternoon, evening or during the night, precipitation will develop. This situation is the most common observation that occurs in Sydney. 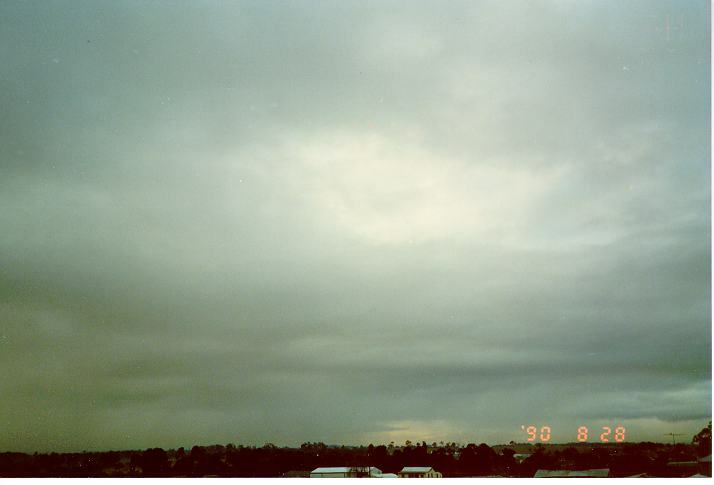 However, altostratus can develop at any time as well as the associated precipitation. 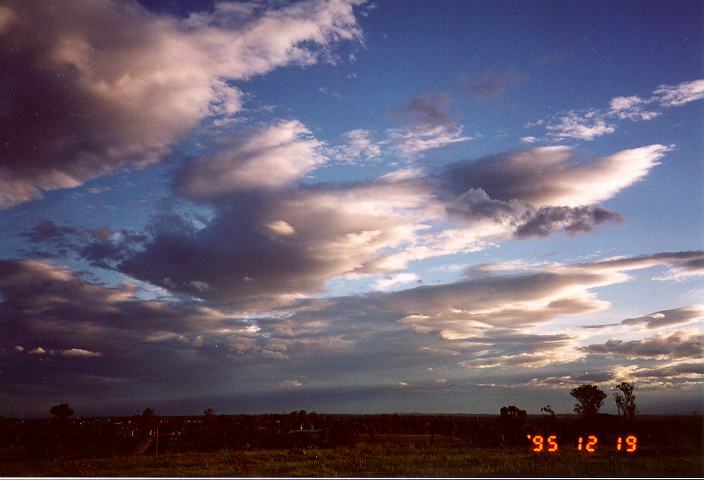 Some altostratus develop in situations similar to the development of lenticular altocumulus. 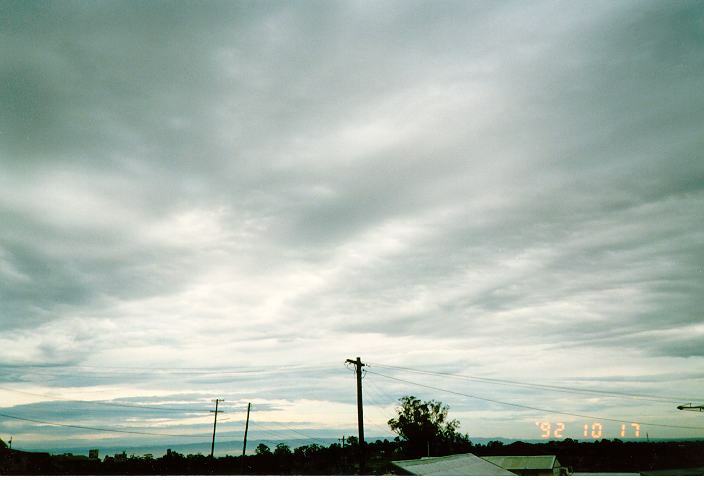 Altostratus in this form develops in large sheets and has a patchy base appearance. The cloud seems to be moving rapidly but because of its development at the rear actually progresses very slowly in the direction of the wind at that level. This type of cloud does not produce any rain. 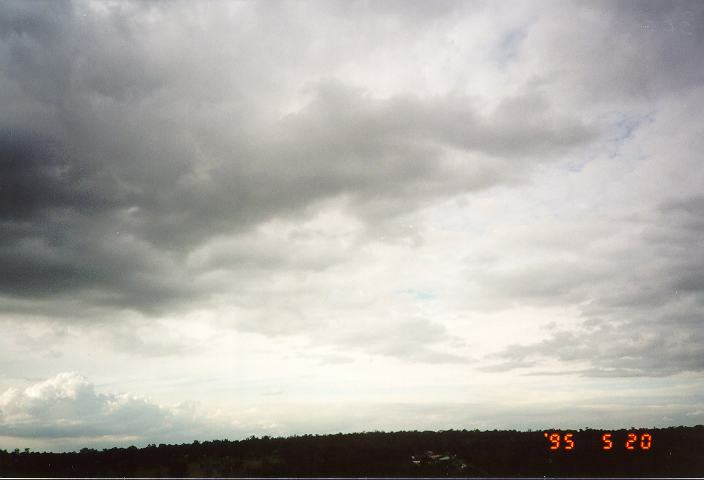 Because of its lack of contrast, it is difficult to determine the apparent speed and direction of nimbostratus. 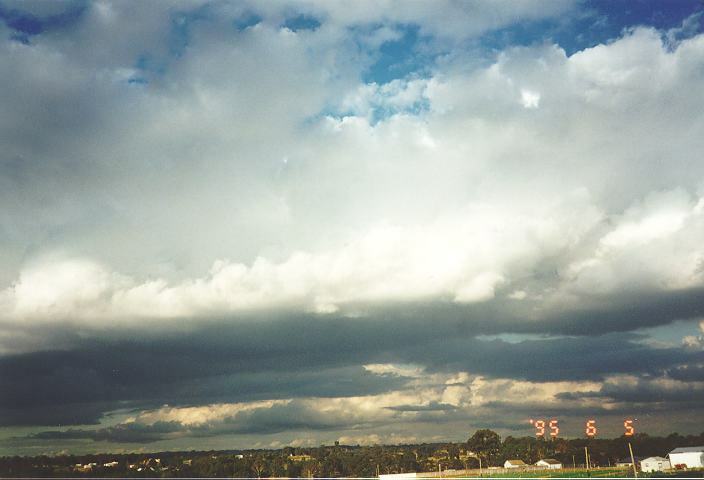 This speed can sometimes be determined by observing the movement of a break in the cloud or observing the cloud's motion against the occasional glimpse of the sun or the moon that is relatively motionless. 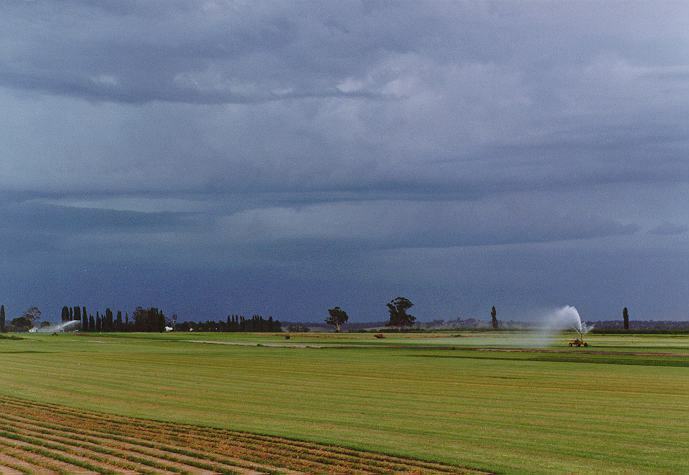 Another method involves the observation of approaching intermittent showers although patterns of precipitation can sometimes change dramatically. 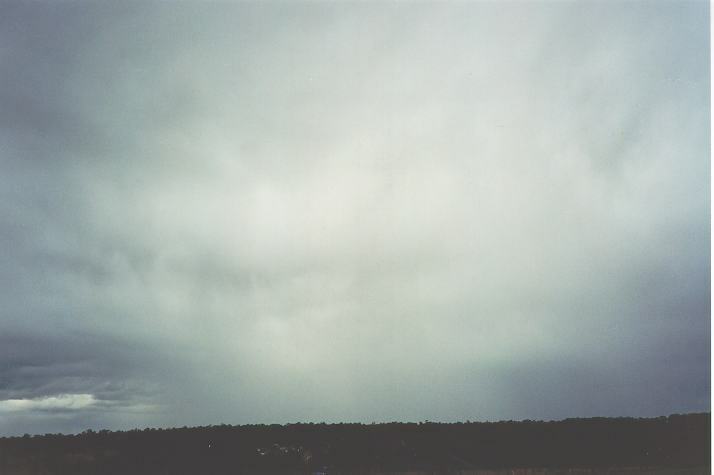 Generally, precipitation associated with nimbostratus is long in duration. The intensity can vary from light to heavy depending on the associated conditions. 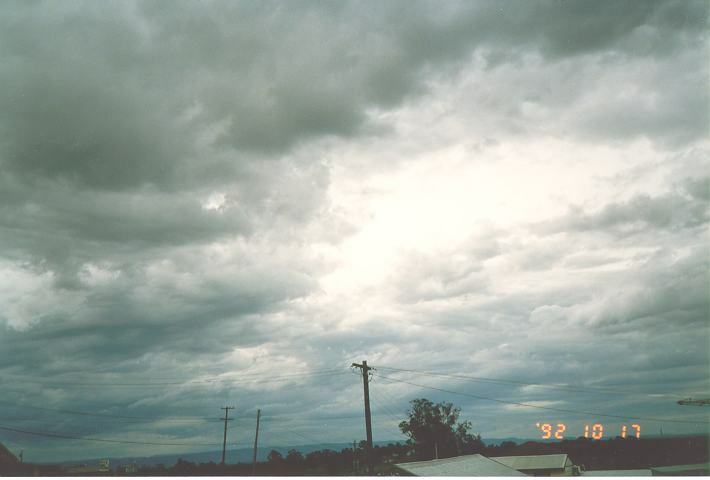 Normally, light to moderate rain is associated with nimbostratus. However, the passage of strong lows and cold fronts can produce moderate to heavy precipitation. 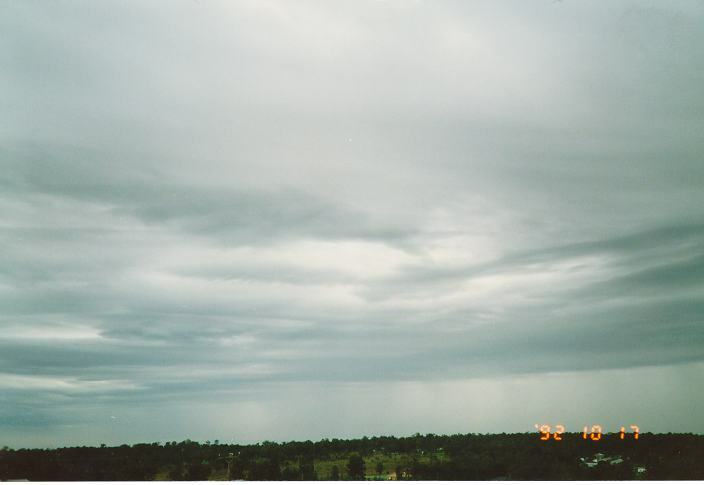 In Sydney, weather associated with flooding rains often contains thick nimbostratus layers. 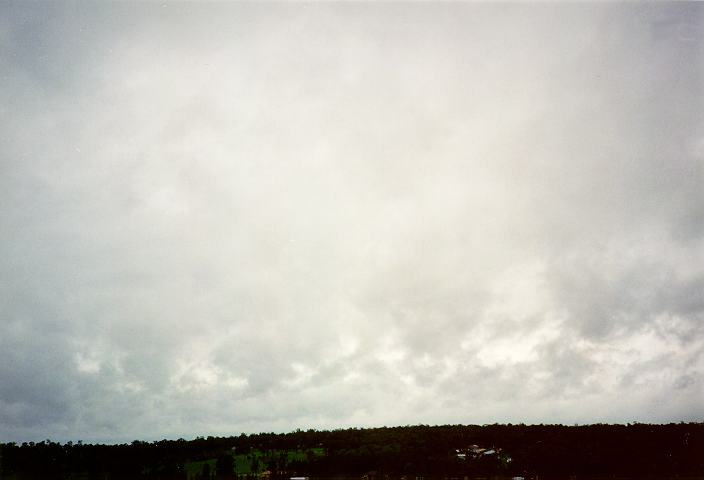 As discussed in earlier cases, nimbostratus can develop or occur with most other types of clouds. Stratus and stratocumulus will often develop below nimbostratus in its middle level form and obscure the view of the whole cloud base. 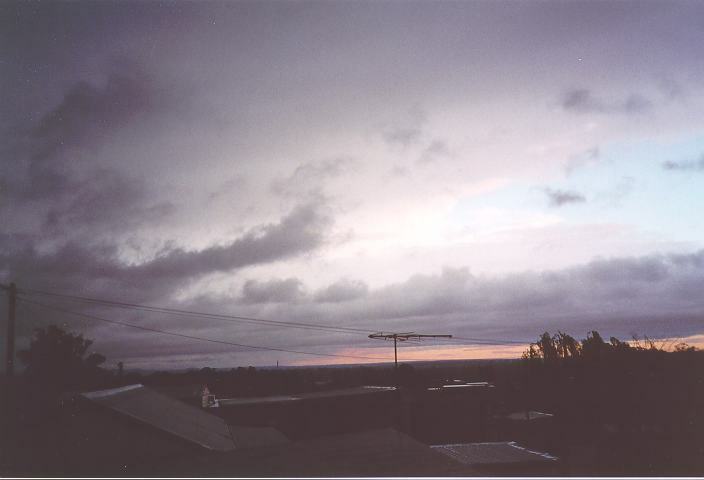 With approaching precipitation regions, the lower clouds may appear darker or lighter than the nimbostratus creating some contrast. 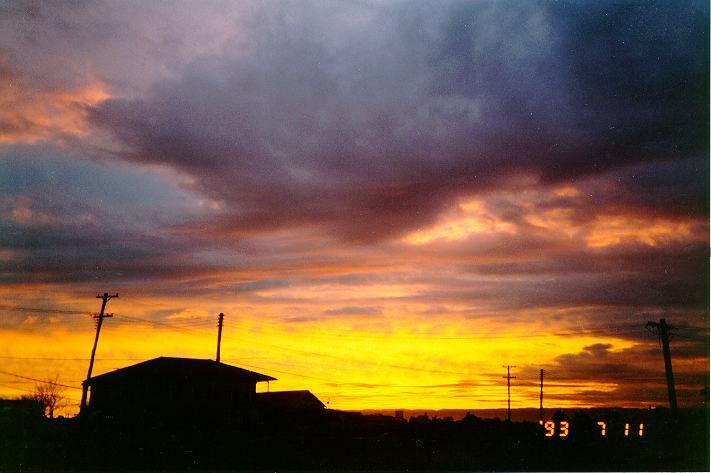 This depends on the intensity of the background nimbostratus. 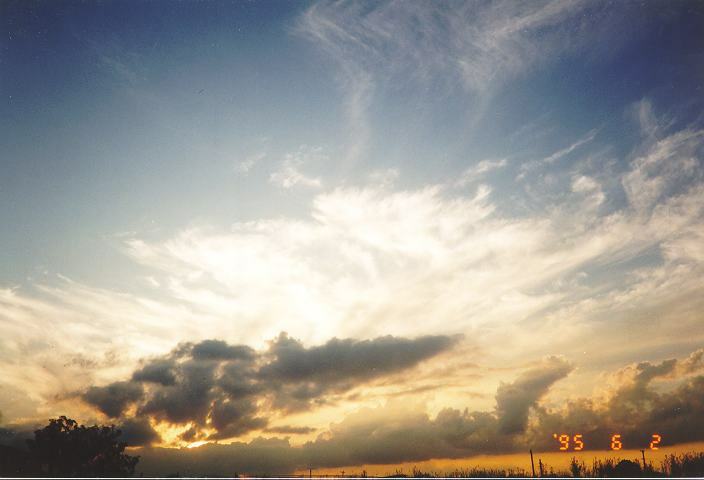 The movement of the lower clouds do not necessarily have to be the same as the nimbostratus. 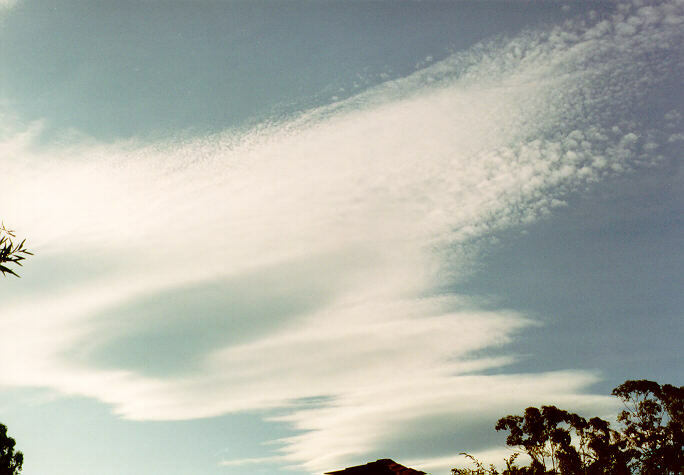 There are three main types of higher level clouds: cirrus, cirrostratus and cirrocumulus. 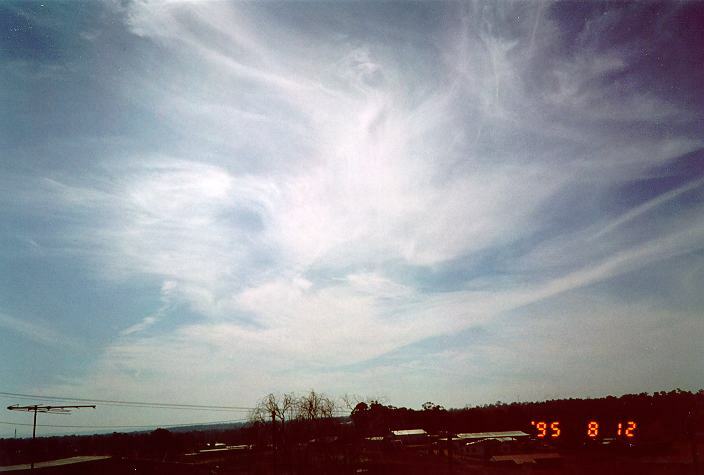 Cirrus clouds are higher level clouds that develop in filaments or patches. They are virtually brilliant white attributed to their ice crystal composition. However, they lack in contrast between the top and base. They occur in flat sheets with a low height to base ratio and are usually isolated with large breaks of sky. Cirrus also vary dramatically in 'shape' or patterns they portray but these represent the fluctuating wind flow at that level both in the horizontal and vertical direction. 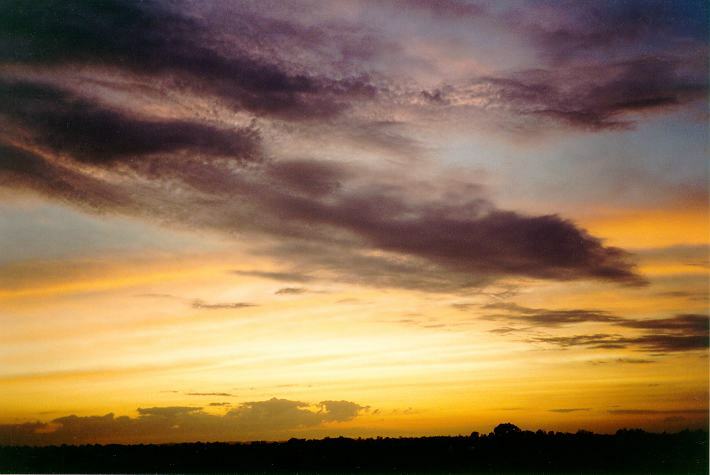 Both cirrus and cirrostratus can occur in conjunction with any of the other cloud types. Obviously, all the lower and middle level clouds will obscure the view of the higher level clouds, appear to move faster and appear less defined. 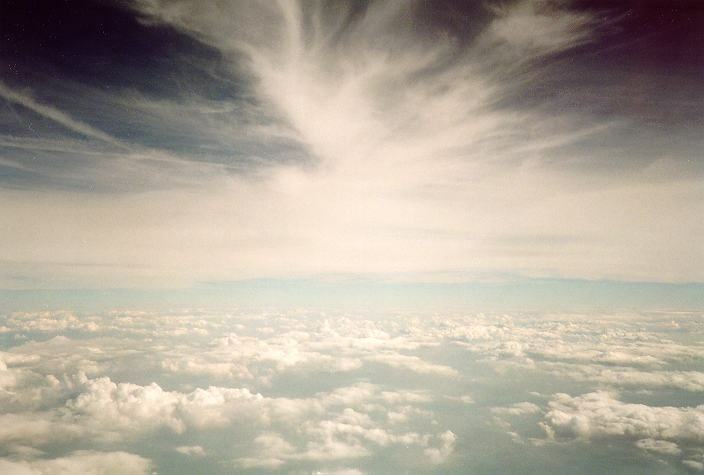 They can only be observed above other clouds when breaks in the clouds occur. 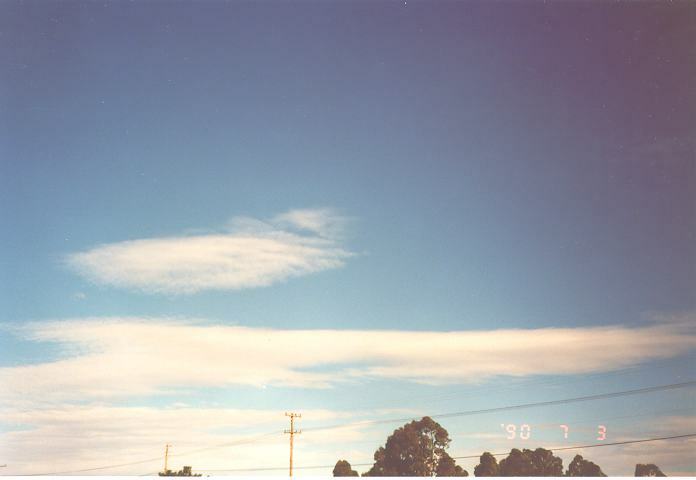 Any type of higher level clouds can develop simultaneously. 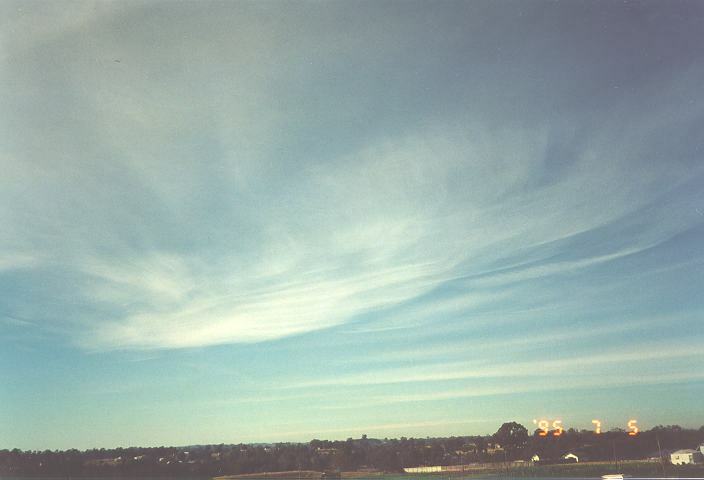 Cirrus clouds tend to develop on days with fine weather and lighter winds at the surface. 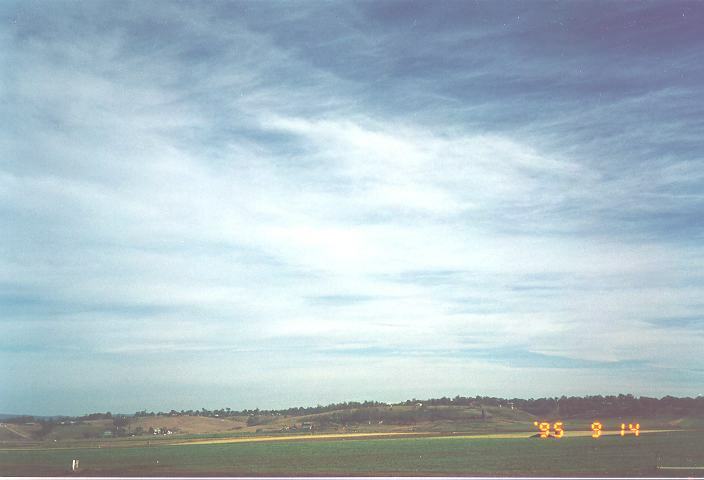 cirrostratus can develop on days with light winds but normally increasing in strength. 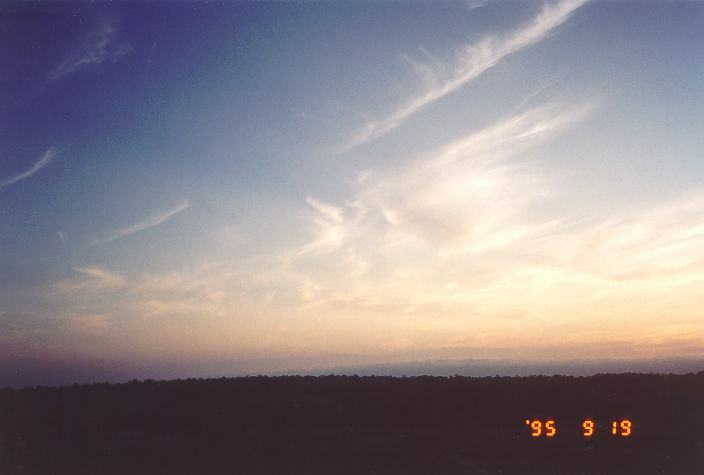 Although both cirrus and cirrostratus tend to develop in fine weather conditions, they also acts as a sign of approaching changes in the weather conditions. Such changes could include any of the various types of cold front situations, thunderstorms or developing and advancing troughs of low pressure, normally with preceding cloud masses. Except in the latter case, cirrus and cirrostratus will typically precede any other types of clouds as part of a cloud band. 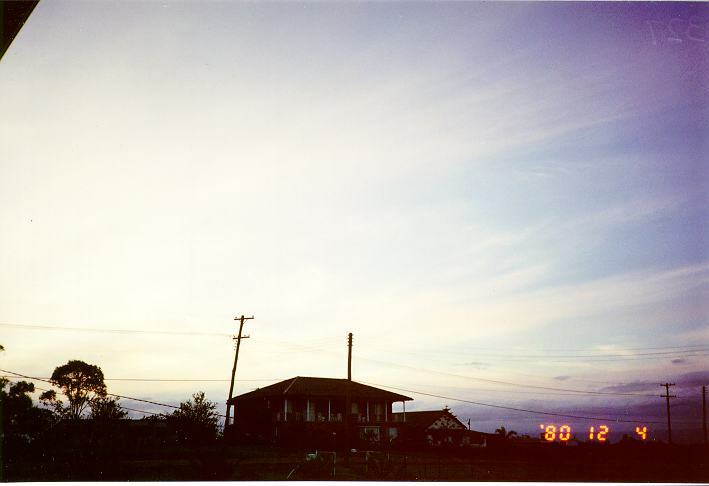 In fact cirrus normally precedes cirrostratus. Nevertheless, the higher level clouds will persist until the actual change in the weather occurs. The higher clouds can develop from a few hours up to a few days before an actual change in the weather conditions occurs. They may develop during one afternoon and dissipate but redevelop the next day and so on until the actual change occurs. 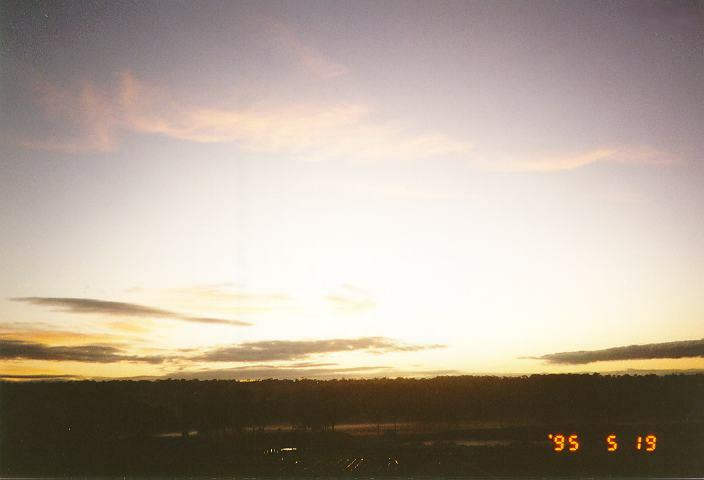 If the amount of moisture in the lower layers of the atmosphere increases, other lower clouds may also develop changing the appearance of the cirrus or the cirrostratus clouds as well as partially or totally hiding them from view. The same situation occurs in the case where cirrus develop ahead of thunderstorms. 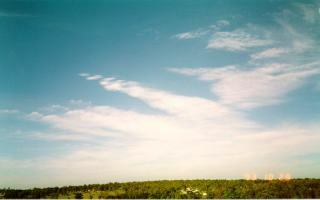 Cirrus normally precede cirrostratus which are then followed by the anvil of the approaching thunderstorm. 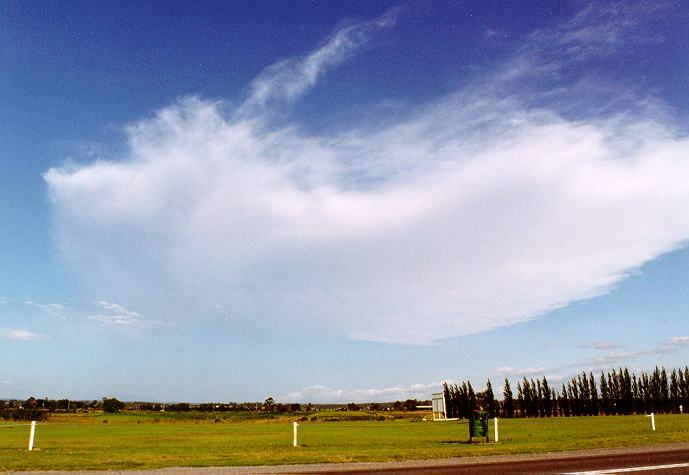 In fact, cirrus and cirrostratus in this case are the remnants downwind of the weakening anvil. Another situation where cirrus and cirrostratus can be observed is when lower cloud breaks or clears during days with showers or rain. This case is far less common but can indicate a few situations. The higher clouds may be the remnants of the cloud mass that produced the actual wet weather. They can also be developing ahead of other cloud masses associated with another system, leading to the situation already discussed above. It all depends on the weather situation at that time but the observation of the movement of the higher level clouds can be critical in determining what weather may follow. 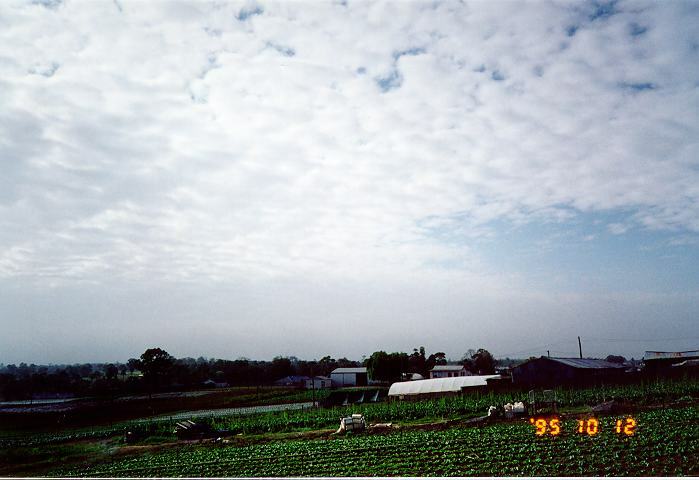 In this photograph, white cirrocumulus globules can just be seen above the altocumulus. This cloud can develop in conjunction with any other clouds as well as with cirrostratus clouds. 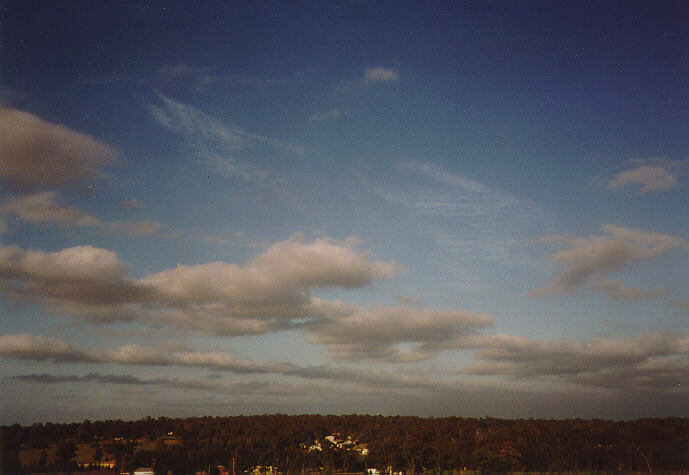 In Sydney, cirrocumulus is not as common as the other high clouds and mainly develops during the winter times with west to south westerly air streams. The development of cirrocumulus sometimes occurs in conditions similar to those associated with the development lenticular altocumulus. 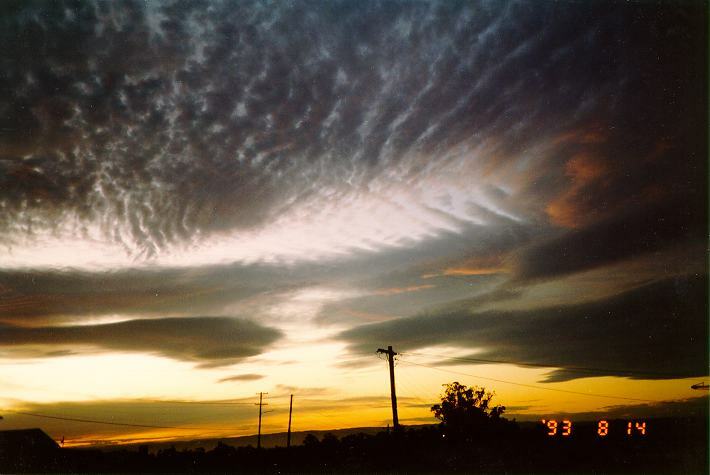 cirrocumulus clouds do not produce precipitation and are normally associated with fine weather. 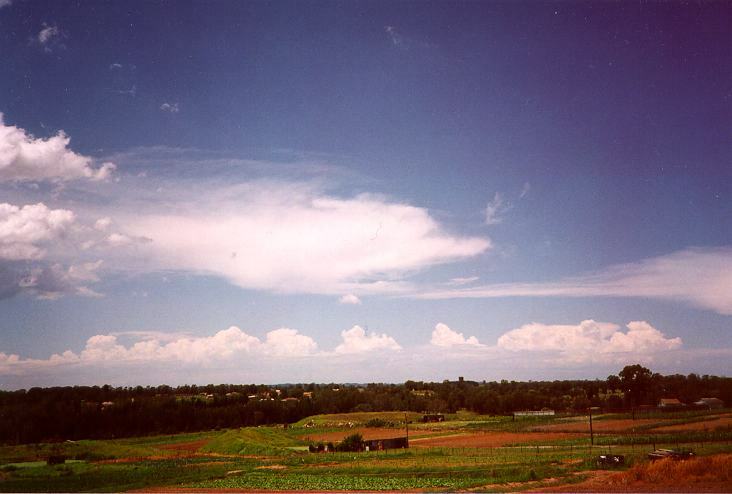 In the section on observing cloud types, the discussion also focused on the fact that more than one type of cloud can exist simultaneously with other cloud types. 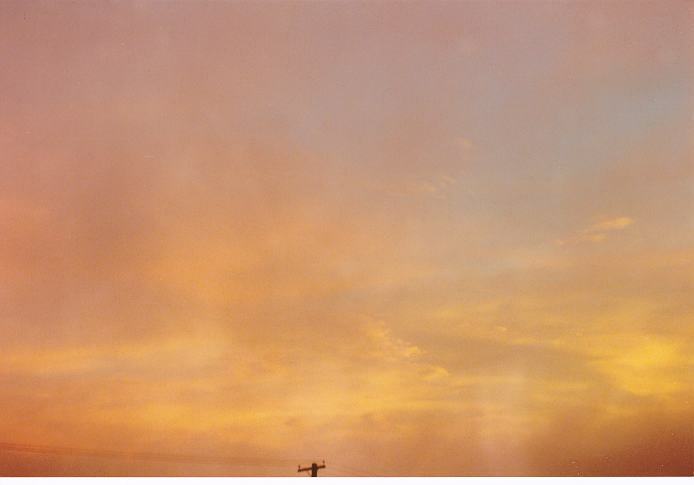 This included combinations of different clouds from the same group or from different groups. 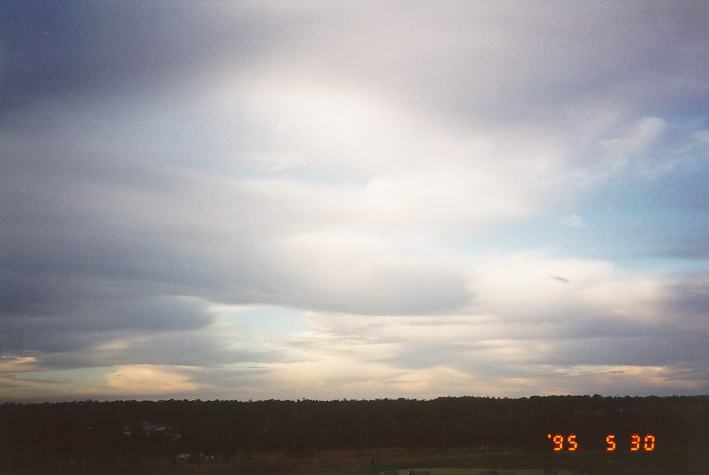 For instance, stratus clouds often may be found with stratocumulus above it (lower level group) or altostratus, nimbostratus or even. 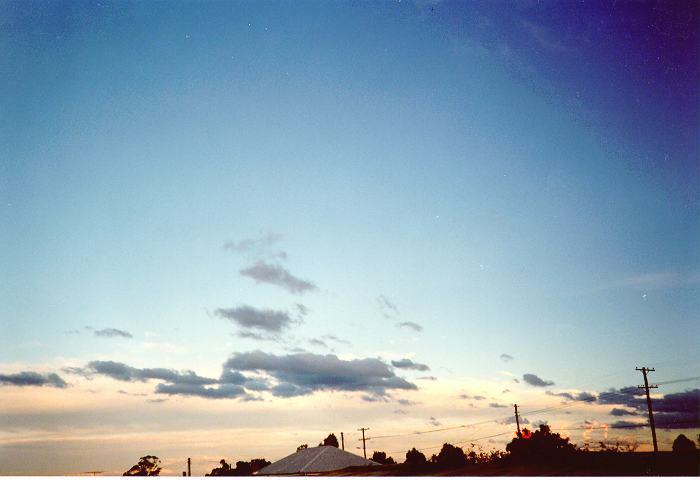 Another example is a combination of cirrostratus and altocumulus. These are just a few from hundreds of combinations of clouds. 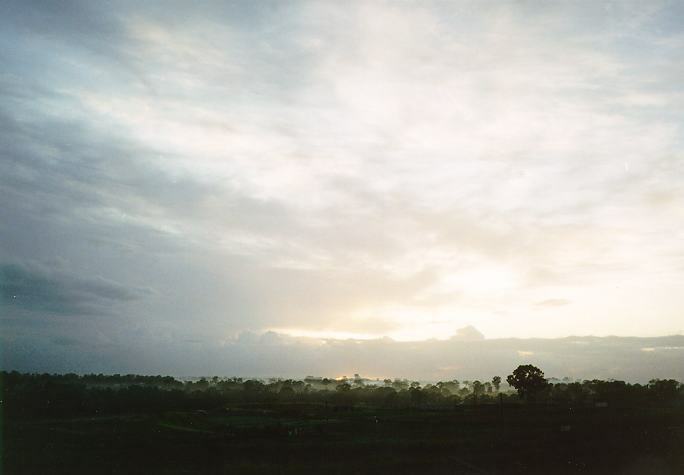 The different combinations of clouds occur depending on certain factors such as the current weather conditions at different layers of the atmosphere as well as the influence of topography. However, the best opportunity to observe combinations of clouds is when thunderstorms approach. 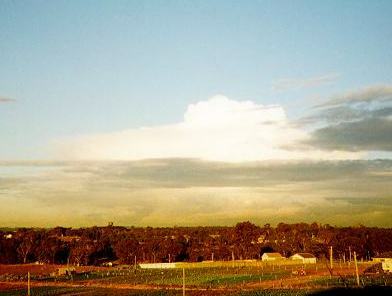 The whole system of clouds associated with thunderstorms are together known as cumulonimbus clouds. 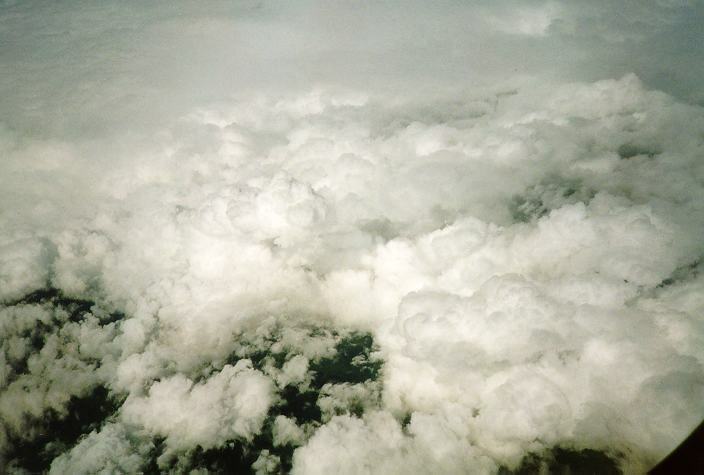 Cumulonimbus as viewed from above. 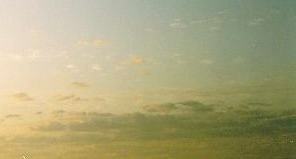 The aeroplane had to rise above the cloud because of risk from turbulence. Cumulonimbus clouds, which are normally associated with thunderstorms, consist of a combination from some or all of the cloud groups. 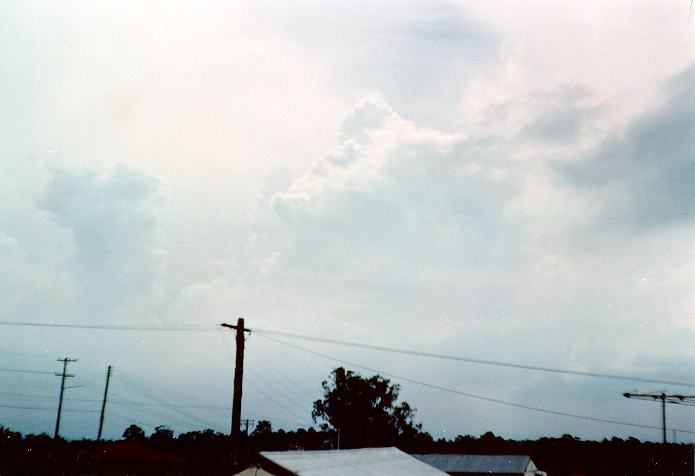 The heights of cumulonimbus clouds vary depending on the conditions but are typically of the order of tens of kilometres from the base to the cloud tops. As a general rule, the most severe type of thunderstorms known as supercells have tops that pierce the tropopause. Smaller thunderstorms do not rise to the tropopause. Thunderstorms are discussed in its own section.